The concept behind Xiu Xiu comes from the combination of two creative minds: Maurici Ginés and David Torrents. 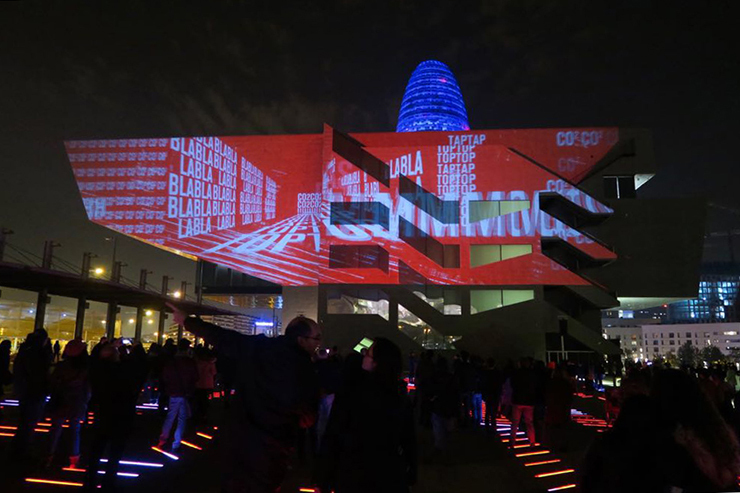 Designed as an interactive mapping for the Llum BCN Festival 2018 held in Poble Nou, it was meant to interact of a previous piece from Ginés: BruumRuum! 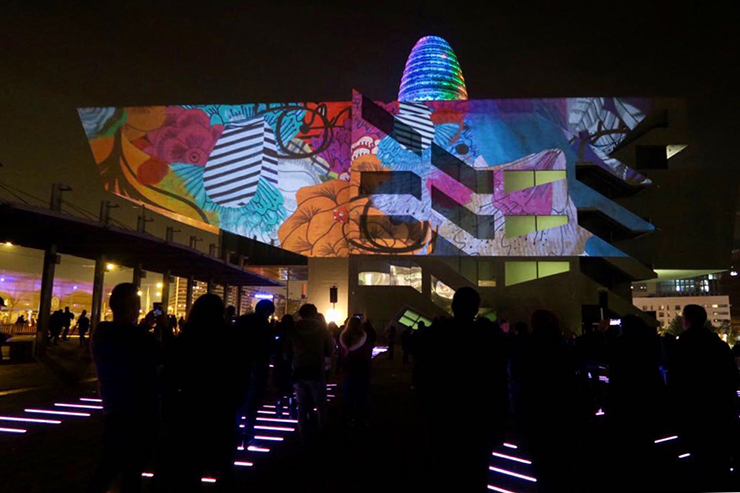 by establishing syncronization between the mapping of the facade of DHUB and the rythm oft he lights of the permanent exhibition This immersive experience allowed people to interact not on with light but also with color and sound, and be part of an unparalleled experience. The XiuXiu ephemeral project was created for the LlumBCN 2018 festival. The project took the existing permanent installation BruumRuum! 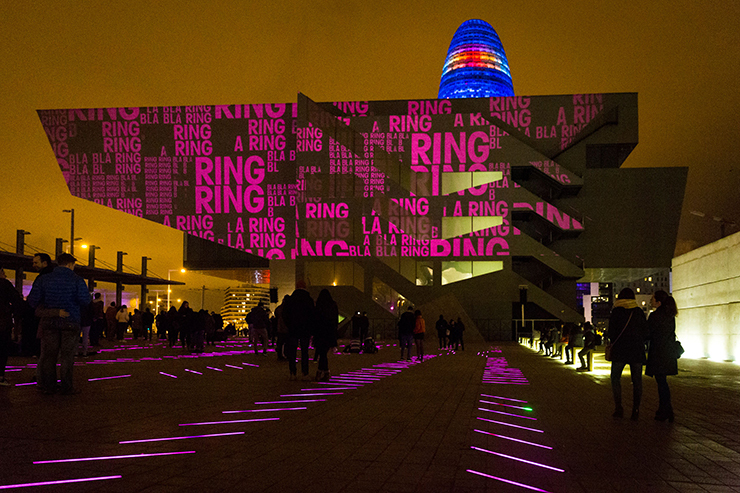 located in the Plaza del Museo del Disseny in Barcelona, as an advantage point and evolved around it. BruumRuum! consists of lines of light on the pavement of the square, which are distributed by drawing a graphic pattern that represents a sound wave. These lines of light are activated by the voice of people through four microphones located on supports similar to anti-vandalism trumpets. 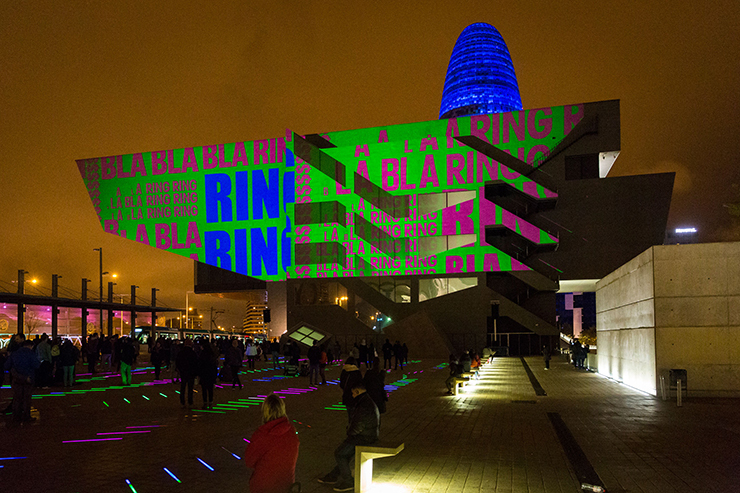 As in BruumRuum!, where the protagonist is the voice, Xiu Xiu proposes to project an interactive mapping on the facade of the Museum to tell the day of a Barcelona native, named Pepitu, from the moment he gets up until he goes to bed, showing all involving his day to day routine. The daily story of Pepitu is explained through graphic and sound onomatopoeias that tell us in a different, abstract and suggestive way a day in the life of any individual. The sounding by means of onomatopoeias was carried out in its great majority with voice effects: beatbox. Especially for this piece both graphic and sound content was created. 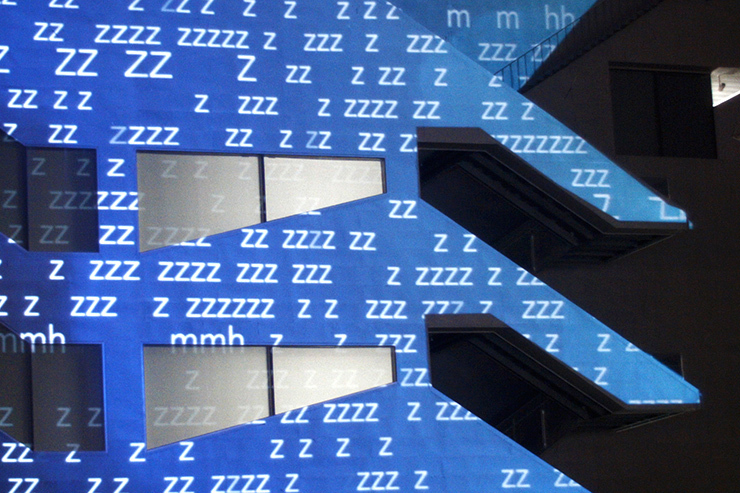 The interaction produced by the floor lines that work in the same chromatic and movement sensation that the abstract video shown in the façade have as a common factor the voice and its graphic expression through onomatopoeia and color. Between each pass, which lasts 6 minutes, the audience in the square is the protagonist, both in the interaction of the microphones in a free form, as in the square as the facade of the Museum of Disseny. 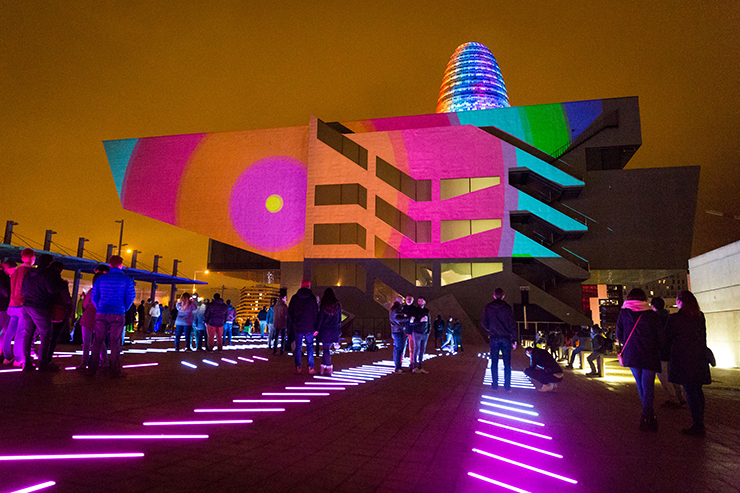 The existing ground lines, reprogrammed to interact with the XiuXiu, are RGB LEDs of 8 pixels per meter, commanded by a Madrix control system. 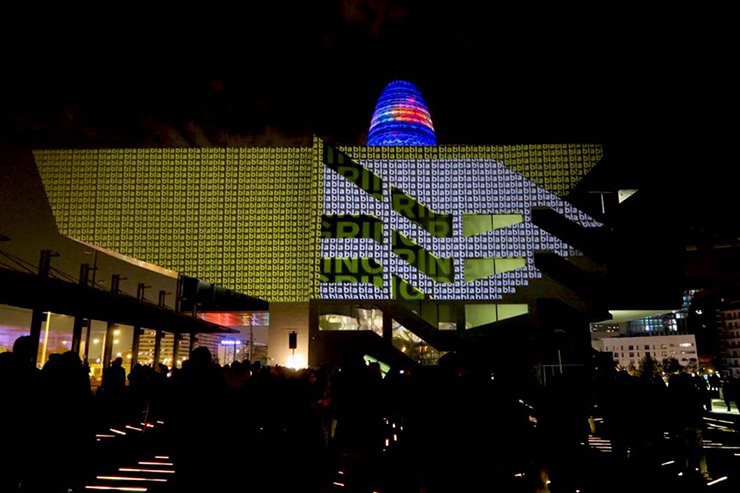 The projection was carried out with two Barco projectors of 30000 lumens and with a watch out system for blending and adaptation to the facade of the building. 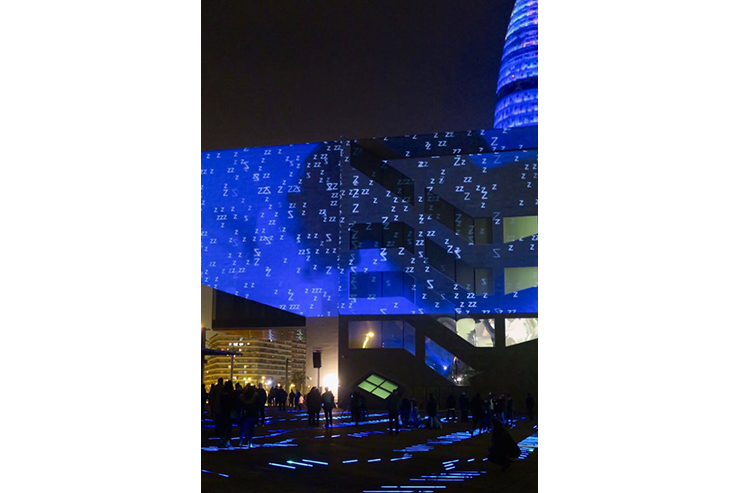 Both systems were connected by Madrix software to interact together through programming designed for this ephemeral piece.